How to clean slate floor tiles in the least amount of time? Slate floors are undoubtedly amazing and are a treat to eyes. Regular maintenance and care are required to preserve its captivating looks as slate is a highly porous natural stone and attracts stains easily. In comparison to other natural stones like granite and marble, slate is relatively delicate and more susceptible to damage from hard scrubs and acids. It is therefore suggested to use soft mops for cleaning slate floor tiles and follow a specified guideline for removing stains. Floor Sweeping: Since slate is a soft material, use a broom with only soft bristle as. Remove debris on the floor by gently moving the broom over the surface. Mop the Floor: A dust mop, which is not oil based, should be used for this step. Move the mop in a single direction to wipe dust and debris off the floor. Avoid moving the mop back and forth as this will bring back the dust onto the floor. Preparing a Water-Based Solution of Detergent: In a bucket, mix approximately one-fourth cup of any mild detergent with a gallon of water. The choice of detergent should the one that is meant for delicate clothing. 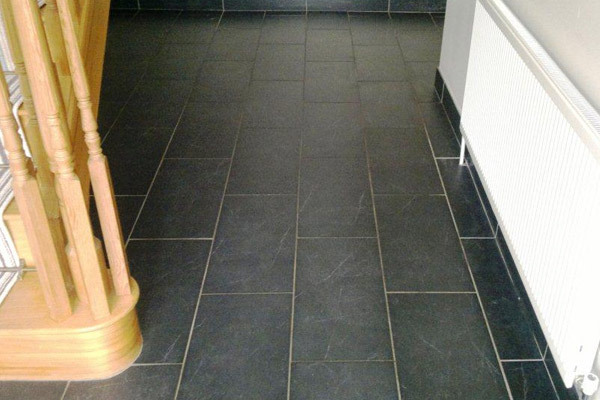 Note: One can also go for a specialized slate floor cleaner available in the market for cleaning slate floor tiles. This should be strictly non-acidic one. Re-Mop the Floor: Dip the mop in the detergent solution and wring out extra water. Move the mop by gently making smooth strokes against the floor. Occasionally rinse the mop to prevent any debris getting stuck into it. Steam mop is another great option. 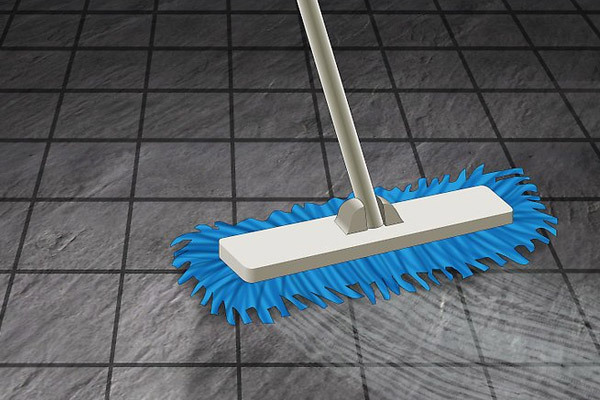 This mop has the ability to extract extra dirt and condensation. If at any point of time the mop seems to start leaving dirt marks or debris on the floor, discard the detergent solution and make a new one. Drying the Floor: Choose a cloth with soft fiber for drying. Gently wipe off as much water as possible with the cloth, so as to prevent seepage into the tiny pores. Thereafter, allow the slate floor to get air dried. Application of Teak Oil: With the help of a soft cloth, apply an extremely thin layer of teak oil on the completely dried floor. In small amount, teak oil will ensure deep cleaning, but the quantity should be as low as it should not start getting into the pores. Note: Though an expensive option, slate oil is a better choice than teak oil. Repeat the Process at Every Two or Three Months: Slate is soft material and requires to be cleaned at regular intervals. In addition to grime and stain removal, this saves you from indulging in much strenuous and deeper cleaning later. Using a Sealer: At numerous hardware stores and with stone retailers, natural stone sealers are easily available. Follow the directions given on the sealer container to uniformly apply the sealer on the floor. This blocks the pores and prevents stains from causing any damage to the floor. Wiping-Off the Spills: Immediately remove any spill as soon as it comes in contact with the surface. This would prevent any material to seep into the pores. A soft towel or cloth should be used for this step. Rubbing out the Stains: This requires a clean and soft sponge or a scrub with non-metallic bristles. Avoid using any harsh or acidic cleaner. A water-based solution of mild detergent or soap can be used to rub out the stains. Using Hydrogen Peroxide: This is recommended for floors that have uncolored grout. Prepare a solution consisting of a mixture of water and hydrogen peroxide in equal proportions, and put it in a spray bottle. Spray the mixture directly on the stain and leave for 10 minutes. Afterward, scrub the stained surface with a soft brush or pad. Note: This mixture has bleaching properties; hence can cause discoloration in colored grout. Using Baking Soda and Peroxide: For tough stains, this process is largely successful. Make a paste by mixing baking soda and peroxide in small quantities. Wait till the bubble formation stops and then apply it on the stain. Thereafter, leave the stain untouched for a few minutes and further wipe off the stained surface with a soft towel or cloth. Using Shaving Cream on Colored Grout: After applying shaving cream on the stain, leave it untouched for 15 minutes. Afterward, use a soft towel or cloth and lukewarm water to wipe off the stains. Note: Apply shaving cream on the spots that are not much prominent, or else it might discolor the grout. 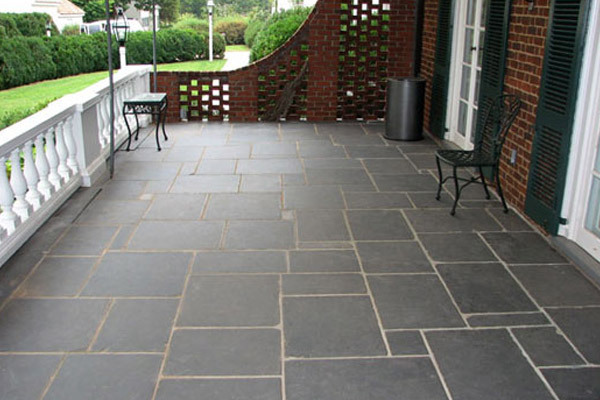 Despite of the fact that slate is a soft and porous material, and more prone to damage; one can keep their slate floors clean, intact and attractive for long by following the afore-discussed measures.